Though the [film]...cannot pretend to be free of its own leanings, Vanderbilt allows a reading of Mapes’ tragic errors amidst its melancholy diagnosing of TV-news’ slow, painful death march from the public trust into modern corporate product. 121 min. Sony Pictures. Director: James Vanderbilt. Cast: Cate Blanchett, Robert Redford, Topher Grace, Dennis Quaid, Elisabeth Moss, Bruce Greenwood, Stacy Keach, John Benjamin Hickey, Dermot Mulroney. 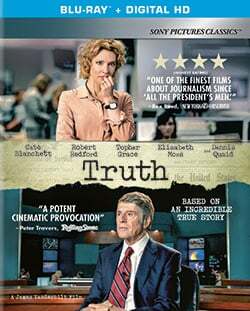 Writer-director James Vanderbilt (best known for scripting David Fincher’s meticulous Zodiac) adapts Mary Mapes’ memoir Truth and Duty: The Press, the President, and the Privilege of Power. Naturally, then, the film’s sympathies lie with two-time Emmy winner Mapes—played by Cate Blanchett as a torturously self-aware variation on the frayed-nerve Blue Jasmine character that won her 2014’s Best Actress Oscar—and with legendary CBS News anchor Dan Rather (Robert Redford, icon as icon). Both journalists lost their jobs and, in many eyes, their credibility as journalists in the wake of a bobbled 60 Minutes Wednesday piece on George W. Bush’s stint in the Texas Army National Guard. Truth argues that while the memos in question may have been authentic (as Mapes and Rather continue to maintain they were, despite aggressive and successful attempts to discredit them in the public eye), their veracity was somewhat beside the point, tragically distracting from a larger truth that held the potential to change the outcome of the 2004 election. As such, Vanderbilt also holds to account Republican efforts to command the conversation and CBS News corporate-caving under the resultant pressures. Unavoidably, the film projects a liberal leaning as it lionizes Rather and lionesses Mapes, positioning the former as the latter’s benign, even heroic father figure in contrast to her abusive biological father (Blanchett’s finest moment here comes in a scene laying out the emotional cost of Mapes asking her father to stop publically speaking out against her). Though the at-times clunky Truth cannot pretend to be free of its own leanings, Vanderbilt allows a reading of Mapes’ tragic errors amidst its melancholy diagnosing of TV-news’ slow, painful death march from the public trust into modern corporate product (“I was there,” Redford’s Rather reports ruefully, “the day they figured out the news could make money”) that welcomes an angrily divided “Vox Populi,” via internet comment sections, to speak their own ugly “truths” to disempowered journalists. Sony's Blu-ray + Digital HD special edition of Truth offers reference-quality A/V for a film of this type and fresh vintage. The natural-looking, soft-lit image is beautifully resolved in detail and subtly rendered in its hues. The picture is a bit on the low-contrast side, with somewhat murky blacks, but that's an accurate representation of the filmmakers' intent, adding to a more filmic look if subtracting a bit from dimensionality. The DTS-HD Master Audio 5.1 mix doesn't miss a trick of this talky material, with dialogue that's never less than clear and music that's presented with a nimble discretion of instrumentation and an overall full sound. The commentary with James Vanderbilt and producers Brad Fischer and William Sherak covers all the bases of script development, production, editorial choices, music, and working with the cast, while also touching lightly on "Rathergate." Six "Deleted Scenes" (12:11, HD with "Play All" option) include "Heyward Introduces Rather Extended," "He Wore That Uniform," "Meeting Burkett," "I Knew You Could Do This," "Gotta Go Kiddo" and "Josh Offers to Resign." The featurette "The Reason for Being" (11:32, HD) intersperses film clips with interview clips of Dan Rather, Mary Mapes, Robert Redford, Cate Blanchett discussing "Rathergate" and the state of American media. Similarly, the promo-style "The Team" (8:43, HD) comprises film clips and interview clips of Redford, Blanchett, producer Brett Ratner, Fischer, Vanderbilt, producer Andy Spaulding, Dennis Quaid, Topher Grace, Elisabeth Moss, Bruce Greenwood, and Stacy Keach, as well as a bit of B-roll from the set. Discussion centers around Vanderbilt's approach and the characters as understood by the actors who play them. "Q&A with Cate Blanchett, Elisabeth Moss, and director/writer James Vanderbilt" (32:59, HD), moderated by Jenelle Riley of Variety, offers the most in-depth, real-time discussion of the film amongst the video-based extras, and will be especially of interest for fans of the actors. All site content © 2000-2019 Peter Canavese. Page generated at 04/18/2019 05:49:57AM.